Enjoy reading and share 1 famous quotes about Zeitoun with everyone. “What would happen," Zeitoun asked the captain, "if you and I went below the deck, and just went to our bedrooms and went to sleep?" would run aground or into a reef. In any event, disaster. "So without a captain, the ship cannot navigate." "Yes," the captain said, "What's your point?" Zeitoun smiled. "Look above you, at the stars and moon. How do the stars keep their place in the sky, how does the moon rotate around the earth, the earth around the sun? Who's navigating?" The captain smiled at Zeitoun. He'd been led into a trap. "Without someone guiding us," Zeitoun finished, "wouldn't the stars and moon fall to earth, wouldn't the oceans overrun the land? Any vessel, any carrier of humans, needs a captain, yes?" Want to see more pictures of Zeitoun quotes? 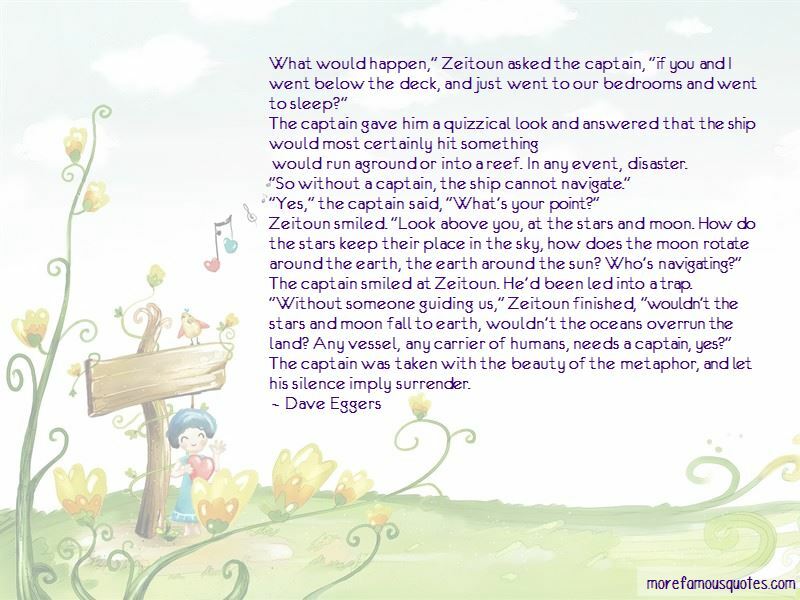 Click on image of Zeitoun quotes to view full size.